Home | Vinyl Siding Installation | Things to do this winter: Skiing, ice skating, and a siding installation? What are your plans for this winter season? If you're the outdoorsy type, skiing, snowboarding, or ice skating might be on your list, or perhaps you're even giving ice fishing a try. If you're not a fan of snow and cold temperatures, weekends in front of a fireplace with some good books might be on your agenda. But what if your home needs new siding - is that a project that can be done during the coldest months of the year? The answer is yes, as long as a few guidelines are followed. In fact, installing siding in the winter might even earn you a discount. Vinyl siding - The major concern when installing vinyl siding in cold temperatures is that the material can become somewhat brittle and may crack when being cut. If possible, keep the siding in a heated space, or at least out of the cold, and only remove a box at a time during the installation. Wood siding - Cold weather doesn't bother a wood siding installation at all, but protecting the siding once it's on your home is another matter. Just about all paints and stains have strict guidelines as to how cold it can be during application. Many manufacturers recommend that it be at least 50 degrees before attempting any exterior painting. If it has just snowed or it's in the forecast, moisture on the wood can affect painting and staining as well. Fiber cement - Prefinished fiber cement siding can be installed regardless of how cold it is, but the material should be kept in out of the weather and only removed as needed during application. However, if you choose unfinished fiber cement, the same rules on cold weather exterior painting and staining mentioned under wood siding apply. Brick veneer - Installing brick veneer is a little trickier during the winter, but can still be done if the weather cooperates. Many brick manufacturers recommend that their materials not be installed unless the temperatures are 40 degrees and rising. This suggestion has more to do with the mortar used during installation than it does the actual brick. Care must also be taken that the mortar doesn't freeze at night until it's completely cured, which can take several days. For many siding distributors and contractors, the winter months can be the slowest time of the year and they may welcome sales or projects. 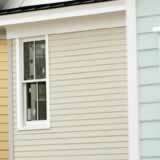 When shopping for siding or a contractor, ask if any discounts are available for cold weather installations.